← Pagani Huayra Documentary, Must Watch! 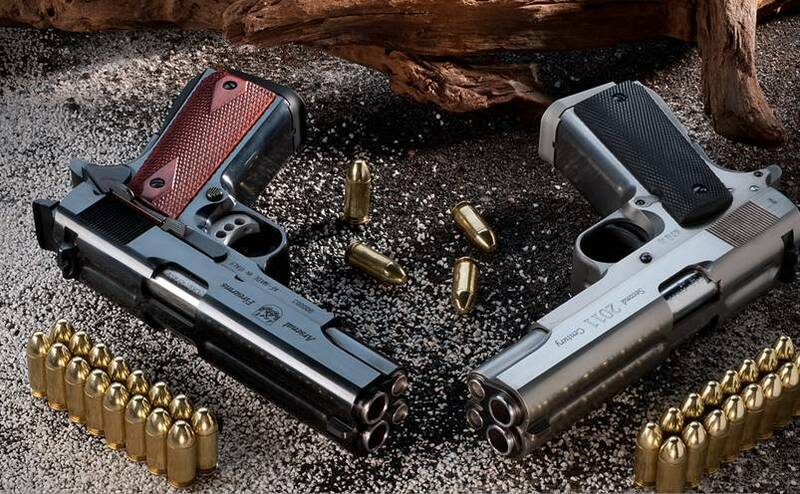 Arsenal Firearms has Brought us the Arsenal Firearms AF2011-A1 Double Barrel Pistol. It shoots 2 .45 caliber rounds simultaneously and will “bring down a bull”. The gun can be handled by any shooter able to shoot with a .45 Acp and it is not only very pleasing, but very accurate and great fun. The AF2011-A1 holds amazing and surprising target performance for the shooter: in fact, it will group all the 8 double .45 caliber rounds (16 bullets) held in the duplex, single columns magazines, in a target of the size of an orange at 15 yards and of a water melon at 25. The stopping power of the AF2011-A1 is tremendous: 2 bullets for a total of 460 Grains weight impacting at 1 to 2 inches apart (depending on the distance of the target) will knock down a bull, while the whole 18 bullets, for a payload exceeding 4000 Grains, can be delivered to the target in about 3 seconds. The AF2011-A1 obviously features a number of very special parts, such as the single slide, the single frame, the single spur double hammer, the single grip safety, the single body double mainspring housing and the single double cavity magazine floor plate, the long and double magazine latch, the special barrel bushings and the hold open lever and side lever safety with long shafts: but the most interesting feature of the new pistol which we strived to keep during the development of the project, is the interchangeability of most internal parts, which come as standard 1911 replacement parts. These include the firing pins, the firing pins plates, the sears groups, the triple springs, the inner parts of the mainspring housings, the recoil springs and recoil springs rods, the magazine bodies and inner parts, the sights (including after market adjustable sights) the grips and grips screws and bushings. The AF2011-A1 (“Twenty Eleven” for aficionados) can be ordered either with 2 independent triggers and one sear group (left or right, with user-interchangeability for right or left operations) or with 2 triggers permanently joined and the choice of 1 or 2 sear groups. The AF2011-A1 is available in mirror finish Deep Blue or with a 3400 Vickers surface hardness White Ash Nitrite coating.